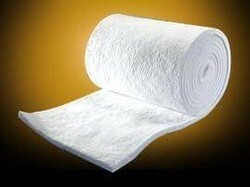 In order to cater the variegated demands of our esteemed clients, we are trading a wide range of Ceramic Fiber Blanket. 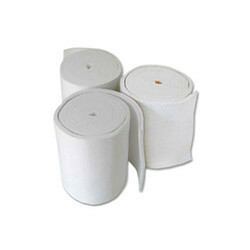 Fiber blankets comes in a roll form and are used for any kind of insulation, behind the fire bricks, pipe and steam lines, water transmission body and the results are extra ordinary. Ceramic fiber blankets preserve the temperature dropping of steam in pipe lines and thus helps to reduce the consumption of fuel being used and therefore saves time and cost. Ceramic Fibre Blanket is a refractory fibre needled mat made without binder from refractory ceramic fibres and provides an effective solution to a wide range of thermal management problems. These blankets offer superior insulating performance, flexibility and resilience. Ceramic Blanket This product offers a cost effective solution to the variegated thermal management requirements. Light in weight, these blankets can easily bear large amount of heat, and do not crack under any conditions. The clients can avail Ceramic Blanket from us, which are ideally suited for operations that involve high temperatures. These are ideal for application in 1200o C and 1400o C temperature, and have densities of 64, 96 & 128 units. This product offers a cost effective solution to the variegated thermal management requirements.